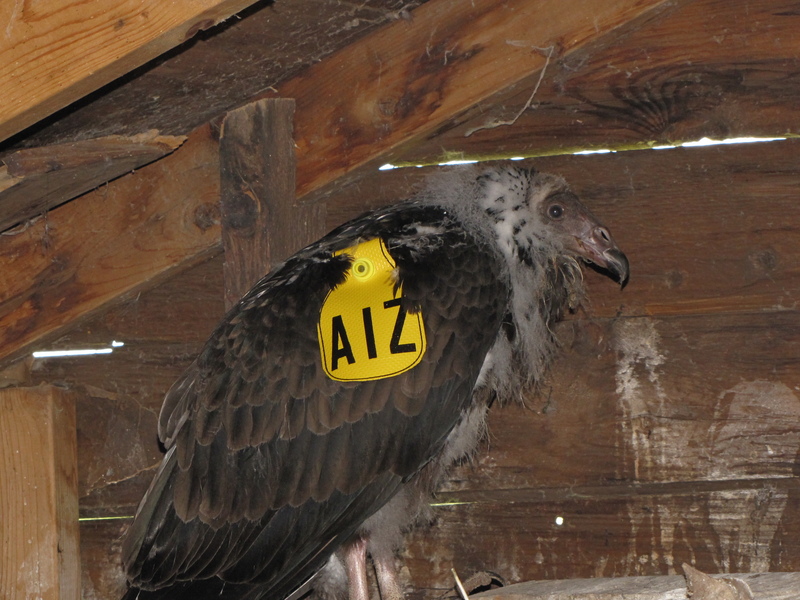 I will write a more detailed post on the Turkey Vulture tagging soon, so in the meantime here are some photos of wing-tagged young Turkey Vultures from earlier this month! Tim at Backyard Chirper’s Into the Air blog just interviewed me. Here’s the blog post if you would like to read the interview. I had lots of fun doing it. Thank you very much for asking me, Tim, and for all of your very kind and generous words! 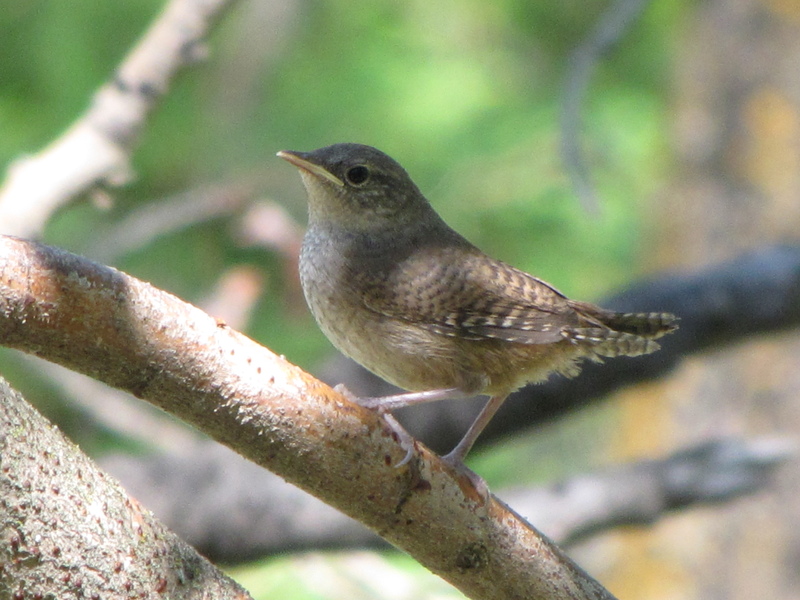 Note from PB’s mother: Prairie Birder left for 4H camp at Moose Lake, Alberta, yesterday (she’ll be back late on Friday), so I’m holding down the fort here again. 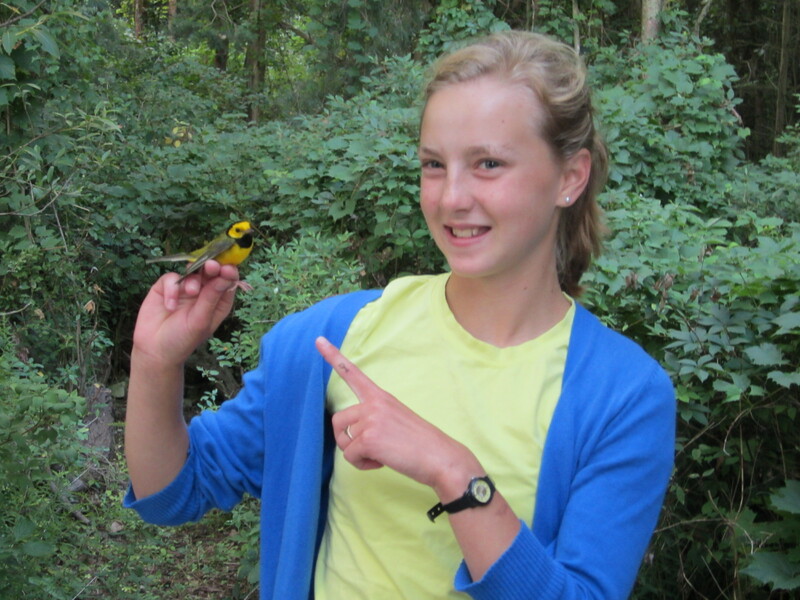 I thought I’d post some of my favorite of Prairie Birder’s pictures from the Young Ornithologists’ Workshop — she took about 700 or so, and posted only a few in her three posts. I hope you enjoy them too. Aug. 12: By the end of today I will be the only YOW left at Old Cut. This morning we opened the nets at 5:45 and they stayed open until noon. 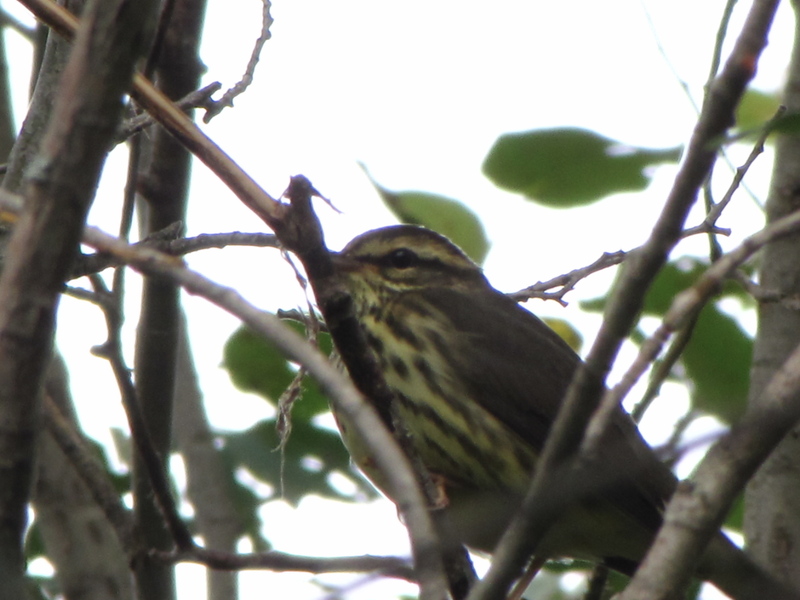 Today was the best day yet for migrants and larger birds. 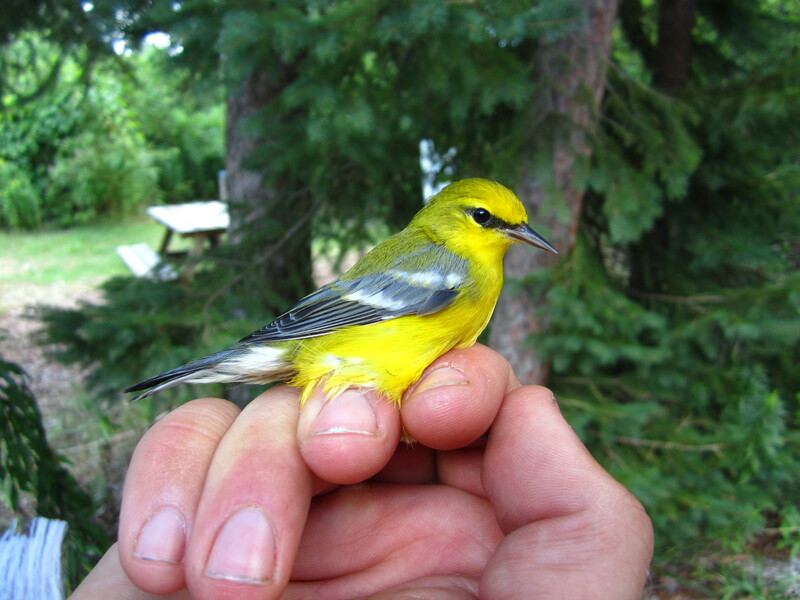 Canada Warblers, one Baltimore Oriole, one Brown Thrasher, one Northern Flicker, one Chestnut-sided Warbler, and one Blue-winged Warbler were some of the highlights of the banding this morning. In the late afternoon after everyone had left, Ana and I went for a walk around Long Point Provincial Park. 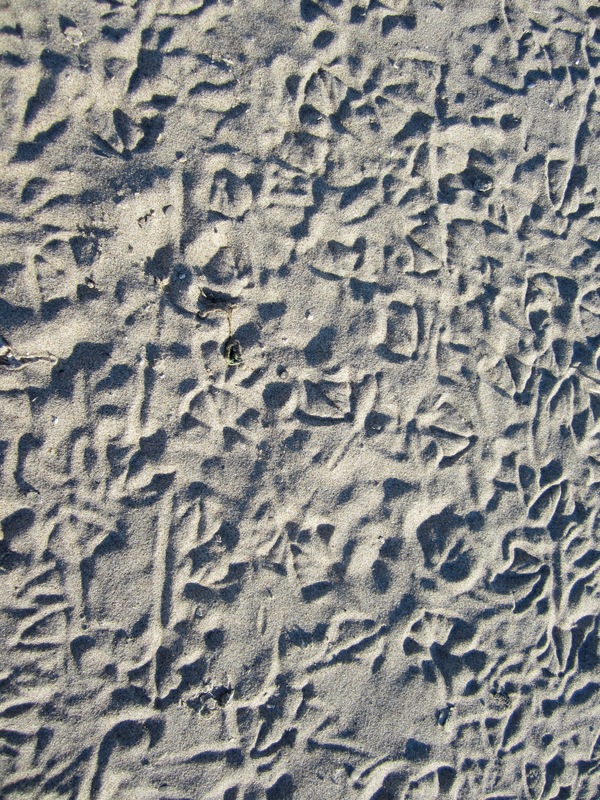 We walked along the beach where hundreds of Ring-billed Gulls were, then we went through the campsites where there was a Northern Mockingbird hopping on the ground. 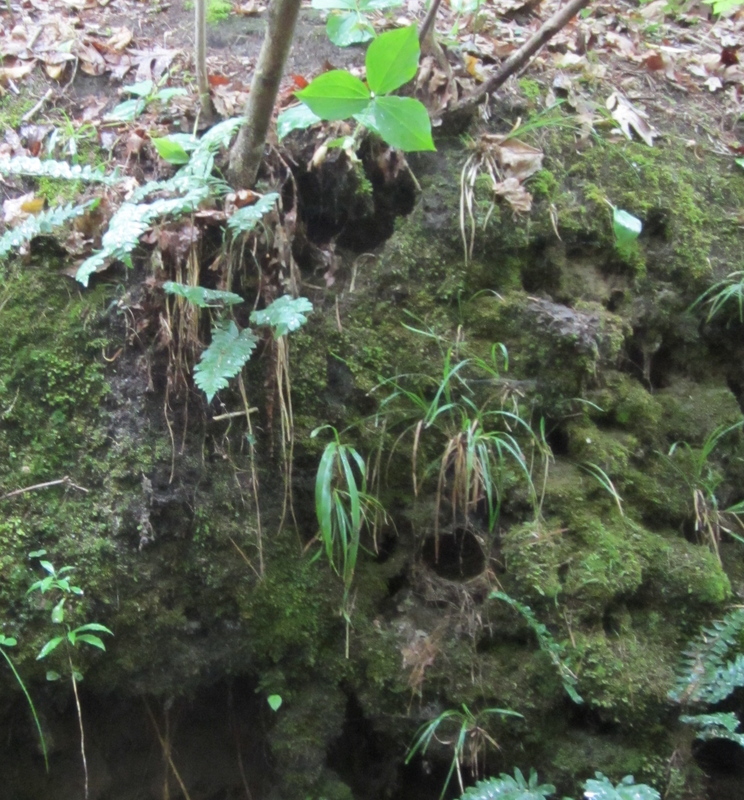 On our way back to Old Cut, we made a detour and walked through a wetland conservation area. While there, for about an hour, dozens of Common Grackles flew constantly over our heads, heading for their roost sites, and many Cedar Waxwing sat in trees gleaning insects. For banding all of the large birds and some of the migrants, we had our names drawn from a hat to see who would have the chance with the really neat birds. Unfortunately my name wasn’t chosen, so I didn’t get to band any of the really neat birds. Aug. 13 (the last day): It was very different waking up in my bedroom without Katie and Saskia. 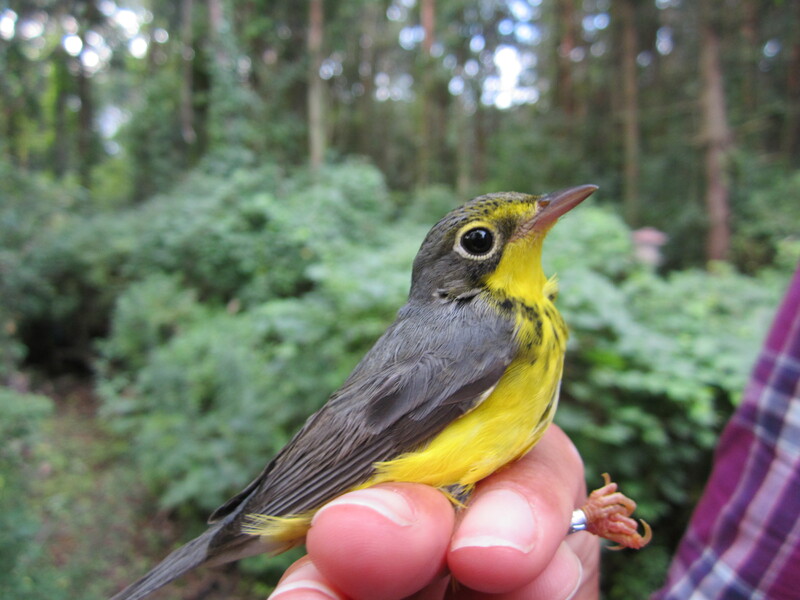 Ana, Matt, and I opened the nets at 7 am and on the first net round we caught a bird that LPBO doesn’t catch much of in the fall — a male Hooded Warbler, and I got to band it! 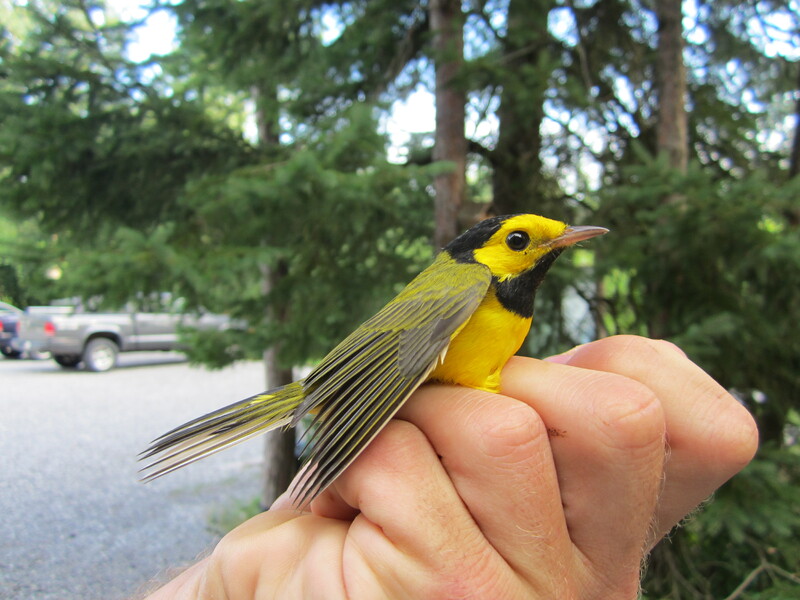 On our Big Day we saw a Hooded Warbler, but you get a whole new look at a bird in the hand. Stu dropped me off at the airport in Hamilton at 5:15 pm and six hours later I was back in the Edmonton airport. My parents were waiting, and after a long drive we were home just after midnight. I have never had so much fun at a camp or workshop before as I had at the YOW! It was very hard to leave Long Point, I made some great new friends, learned so much, and visited some beautiful places. I can’t wait to return to Long Point as an intern, volunteer, or just for a visit. I would especially like to be able to show my family Long Point. 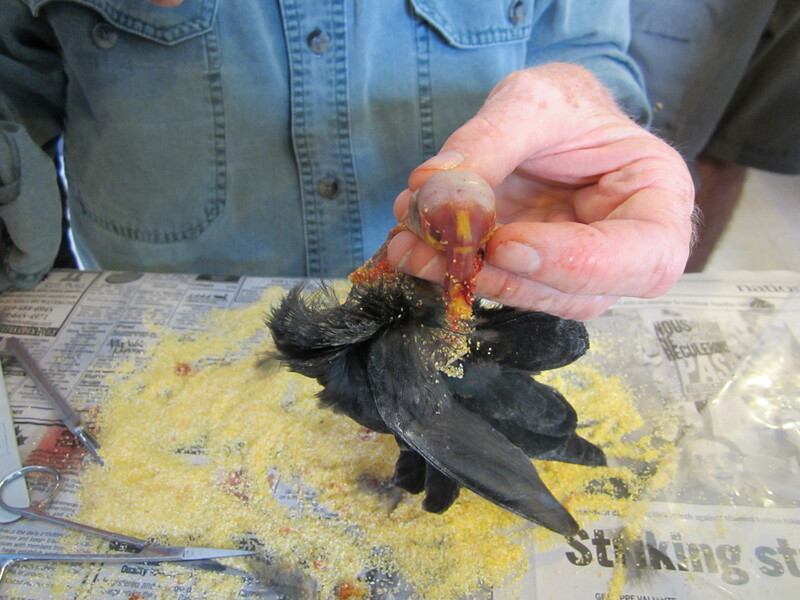 I learned so much at the YOW from so many people — from censusing and banding birds, to making a study skin, to learning about molt patterns, aging, and sexing birds. At the beginning of the workshop, we each received a YOW participants reference guide, which is full of great reading material and wonderful information on banding. I will never forget the great learning experiences, and the great fun I had at Long Point! 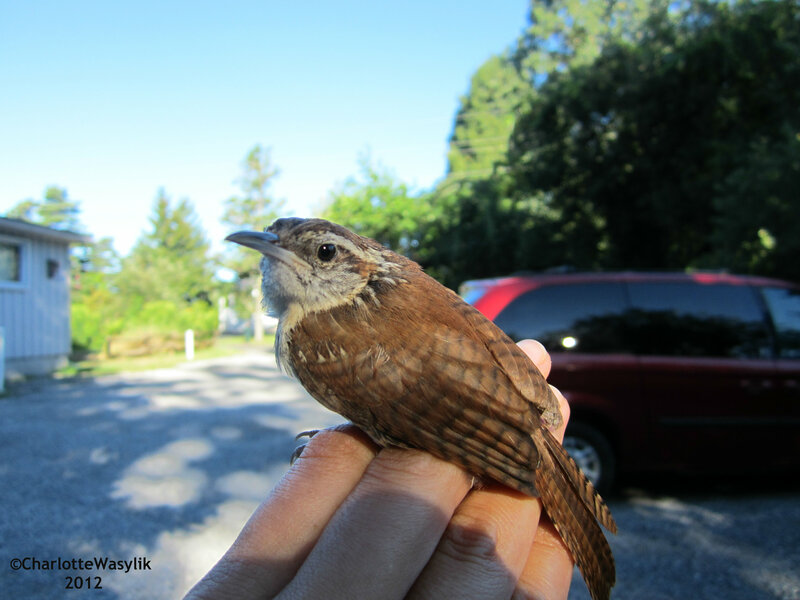 Thank you to everyone at LPBO, Bird Studies Canada, and the Doug Tarry family! I didn’t think I would have to write three parts, but I will have to! Aug. 8: Today was our last day at the Tip, and we were all very sad to leave. There are thousands of gulls at the very tip and Ana thought, as a last tribute, we should run all the way to the Tip and scare all the gulls. It was a plan, and that’s what we did! 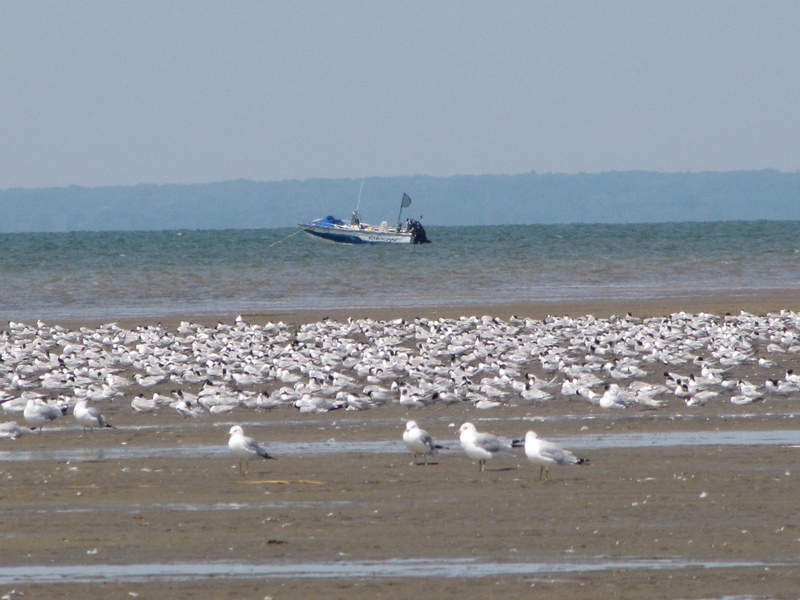 On the boat ride back, we stopped at a very large sandbar, about half way between the Tip and Old Cut, with many Ring-billed Gulls, Common Terns, and about a dozen Caspian Terns. 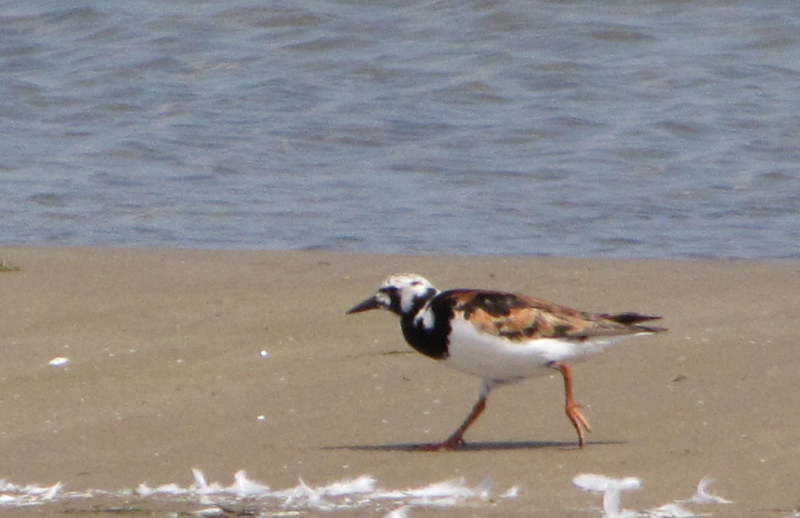 There were also a good number of shorebirds — Semipalmated Sandpipers, Sanderlings, Killdeer, one Semipalmated Plover, and one Ruddy Turnstone. We all made it back to Old Cut in one piece, except one oar which came back in two pieces. Aug. 9: Today was the first day the YOWs were officially able to band. 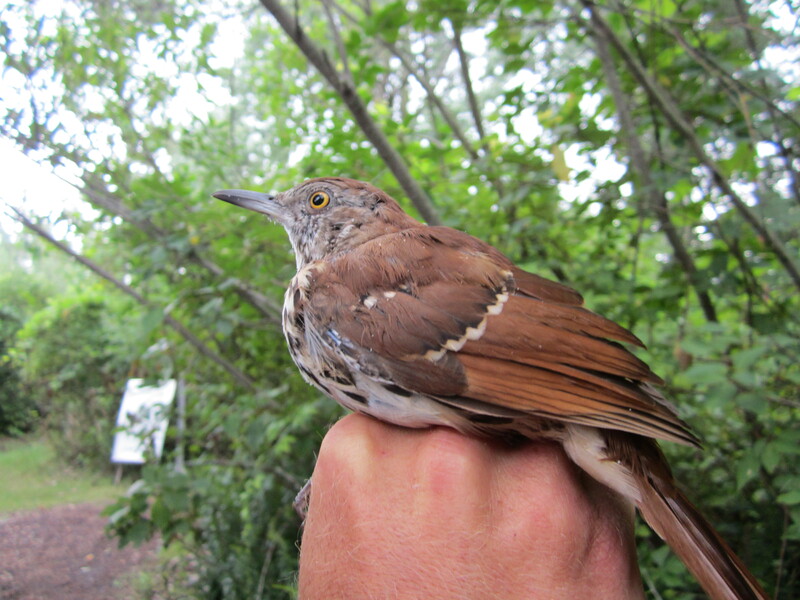 The first passerine I banded was a Swainson’s Thrush! 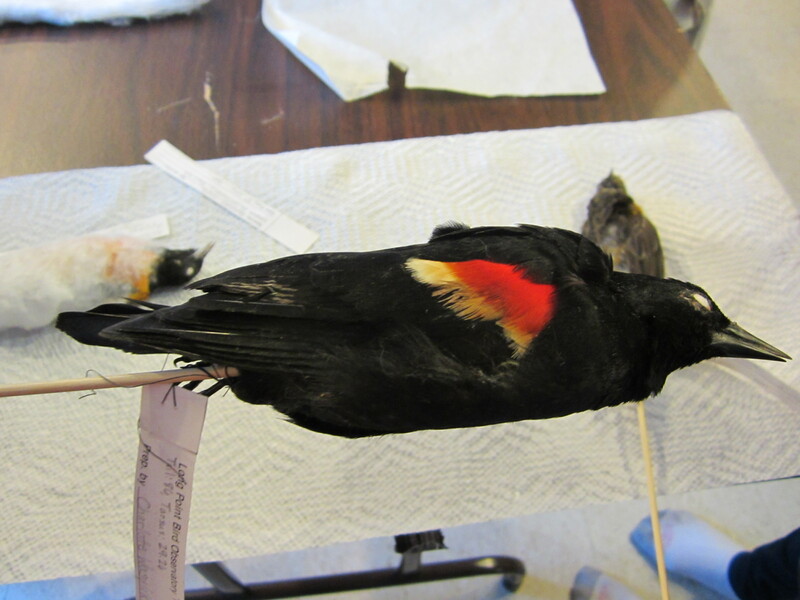 The birds we caught in the nets today were excellent, and we banded 43 birds of 21 species. 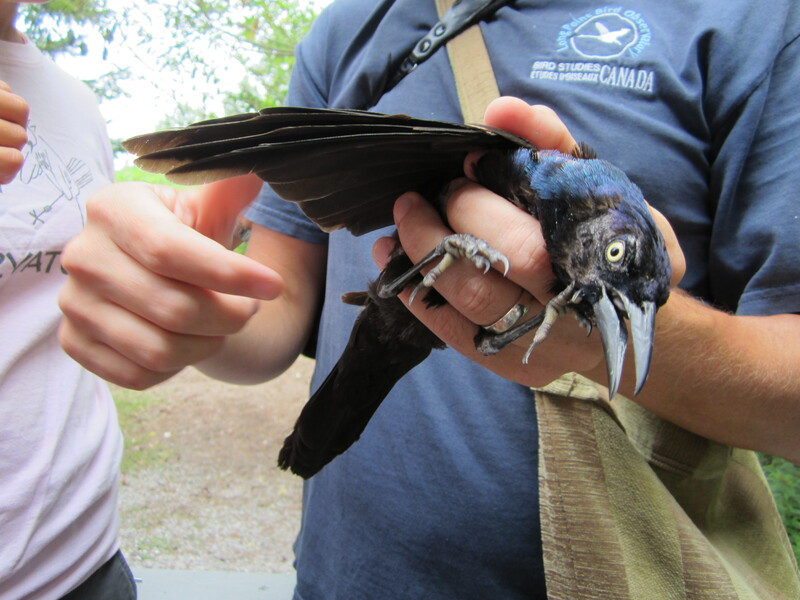 The most exciting bird we caught in the mist nets was a Common Grackle because of its size. Birds American Robin-size and bigger do fly into the nets but they are big and strong enough to get out, so it’s very exciting to get a large bird that stayed in the net. 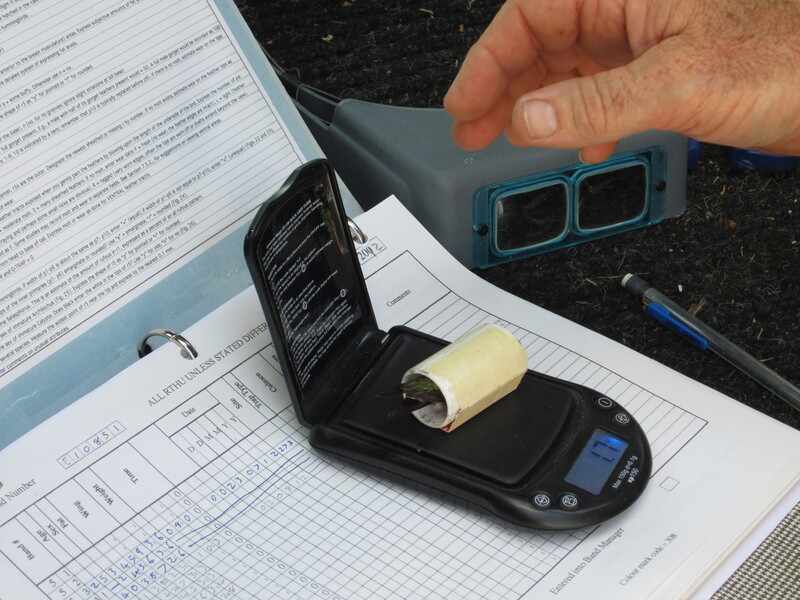 When banding, there are usually two people at work: the bander who bands, takes the measurements, weighs, ages, and sexes the bird; and the scribe, who writes down the species, banding code, band size, measurements, and reminds the bander if s/he has forgotten anything. 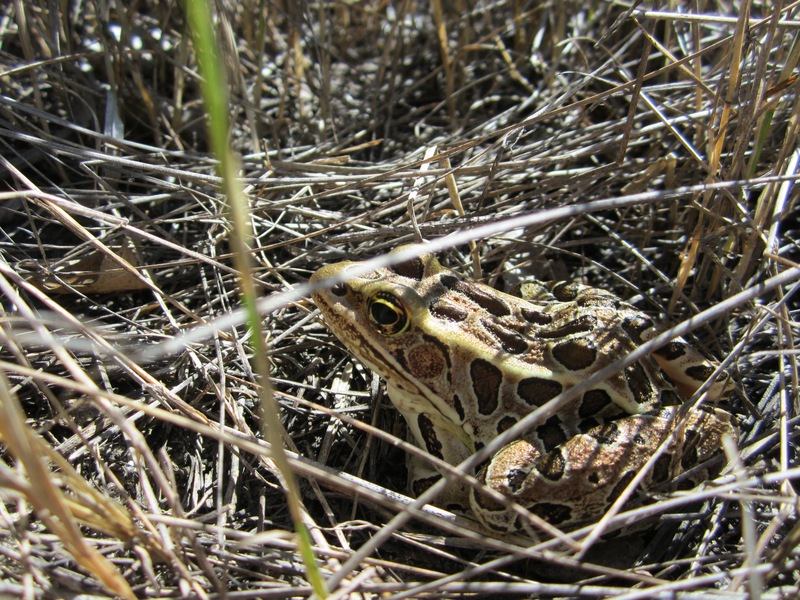 In late morning, Jody Allair took us to one of his field stations, where he does his species at risk work. Jody led us on an hour-and-a-half walk. 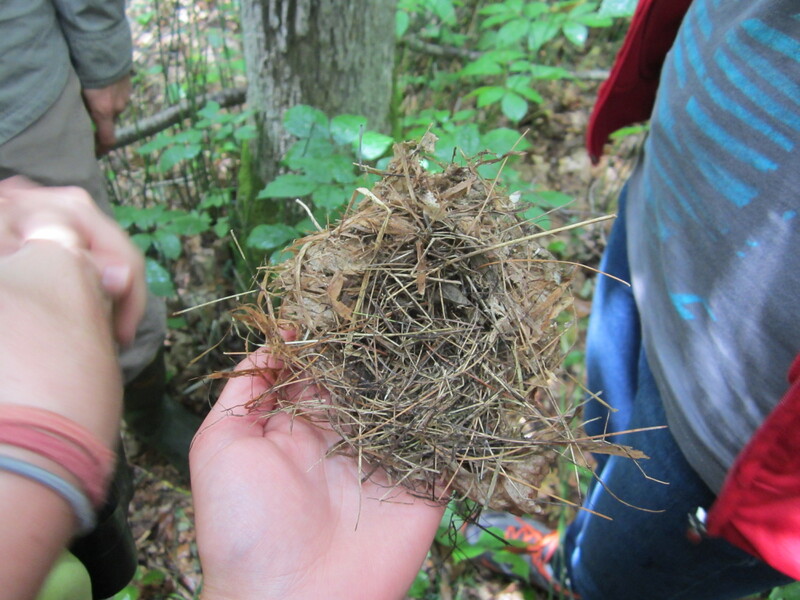 He showed us three very special nests that past YOWs had never seen: There were two Louisiana Waterthrush nests, Hooded Warbler, and Acadian Flycatcher nests. 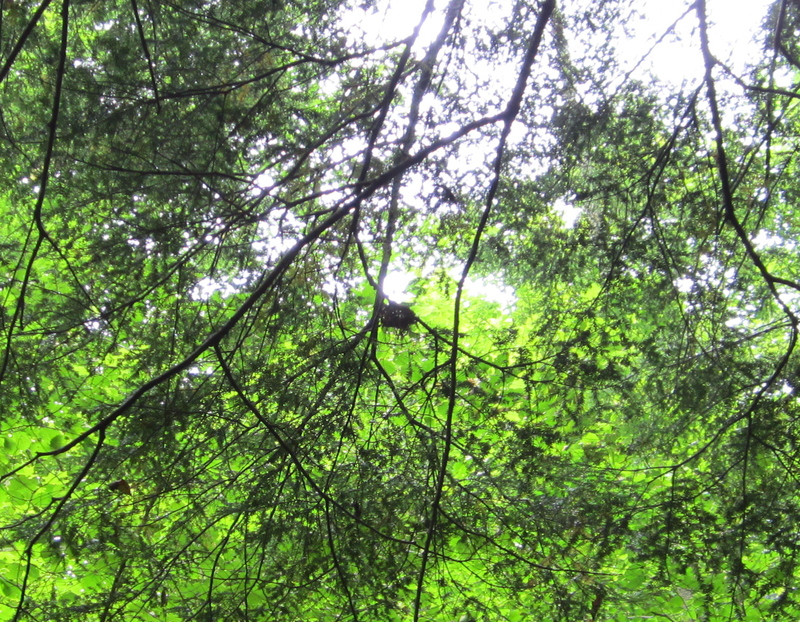 While walking through the woods we heard a Yellow-billed Cuckoo and saw two Broad-winged Hawks. 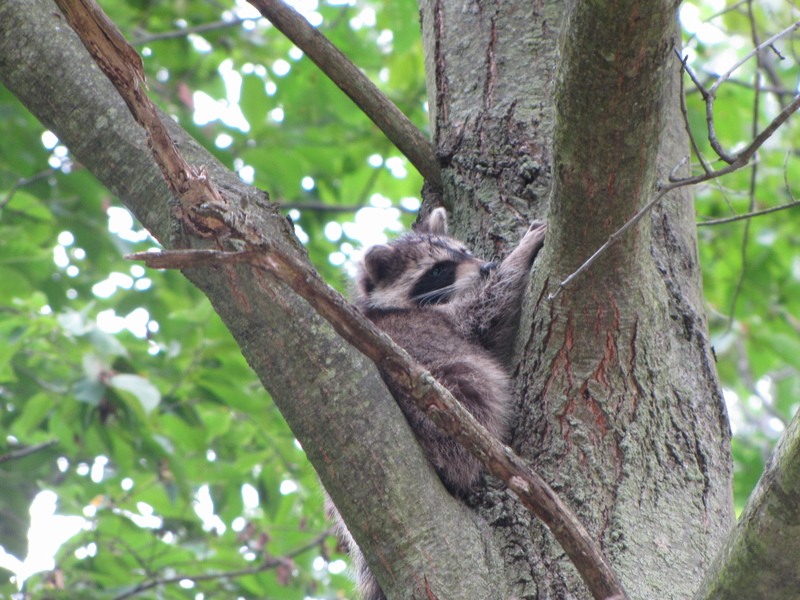 When we got back to the road we walked along it for a while and saw Indigo Buntings, Eastern Towhees, and a young Raccoon. In the afternoon we visited Bird Studies Canada headquarters and saw where Stu, Jody, and Liza work. Aug. 10: Today was our Big Day! The weather wasn’t the best at the start, but we definitely made the most of the day! Jody was with us all morning and afternoon and drove us around. Without Jody, we probably would have had a very low total. 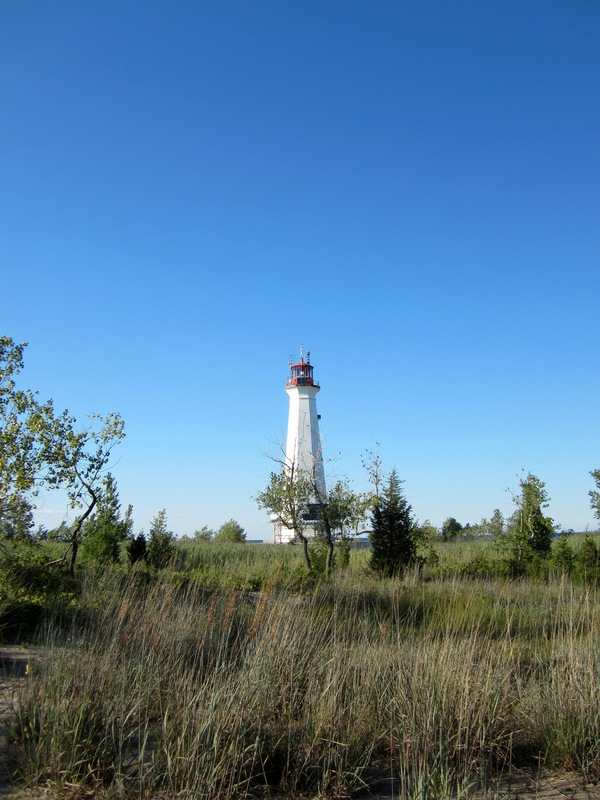 We visited St. William’s Forest, Backus Woods, Townsend Sewage Lagoons, Bird Studies Canada, Long Point Provincial Park, and Big Creek National Wildlife area. We saw so many great birds but the best were Least Bitterns, Hooded Warblers, Great Egrets, White-rumped Sandpipers, and one Stilt Sandpiper! 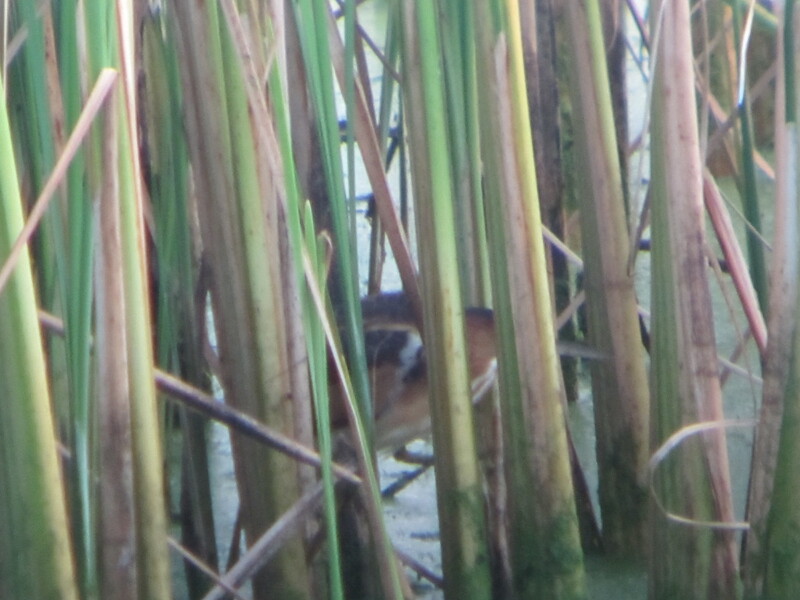 In total we saw 102 species, not the YOW record but we were all really happy with our total! Canada Goose, Mute Swan, Wood Duck, Mallard, American Black Duck/Mallard, Blue-winged Teal, Northern Shoveler, Green-winged Teal, Redhead, Hooded Merganser, Ruddy Duck, Wild Turkey, Pied-billed Grebe, Least Bittern, Great Blue Heron, Great Egret, Green Heron, Black-crowned Night Heron, Turkey Vulture, Bald Eagle, Broad-winged Hawk, Red-tailed Hawk, King Rail, Semipalmated Plover, Killdeer, Spotted Sandpiper, Solitary Sandpiper, Lesser Yellowlegs, Semipalmated Sandpiper, Least Sandpiper, White-rumped Sandpiper, Pectoral Sandpiper, Stilt Sandpiper, American Woodcock, Bonaparte’s Gull, Ring-billed Gull, Herring Gull, Caspian Tern, Common Tern, Forster’s Tern, Rock Pigeon, Mourning Dove, Yellow-billed Cuckoo, Chimney Swift, Ruby-throated Hummingbird, Belted Kingfisher, Downy Woodpecker, Hairy Woodpecker, Northern Flicker, American Kestrel, Eastern Wood-Pewee, Yellow-bellied Flycatcher, Alder/Willow Flycatcher, Least Flycatcher, Eastern Phoebe, Eastern Kingbird, Warbling Vireo, Red-eyed Vireo, Blue Jay, American Crow, Horned Lark, Purple Martin, Tree Swallow, Bank Swallow, Barn Swallow, Cliff Swallow, Black-capped Chickadee, Red-breasted Nuthatch, White-breasted Nuthatch, House Wren, Marsh Wren, Carolina Wren, Blue-gray Gnatcatcher, Eastern Bluebird, Swainson’s Thrush, American Robin, Gray Catbird, European Starling, Cedar Waxwing, Black-and-white Warbler, Common Yellowthroat, Hooded Warbler, American Redstart, Blackburnian Warbler, Yellow Warbler, Eastern Towhee, Chipping Sparrow, Field Sparrow, Savannah Sparrow, Song Sparrow, Swamp Sparrow, Northern Cardinal, Indigo Bunting, Bobolink, Red-winged Blackbird, Eastern Meadowlark, Common Grackle, Brown-headed Cowbird, Baltimore Oriole, House Finch, American Goldfinch, and House Sparrow. 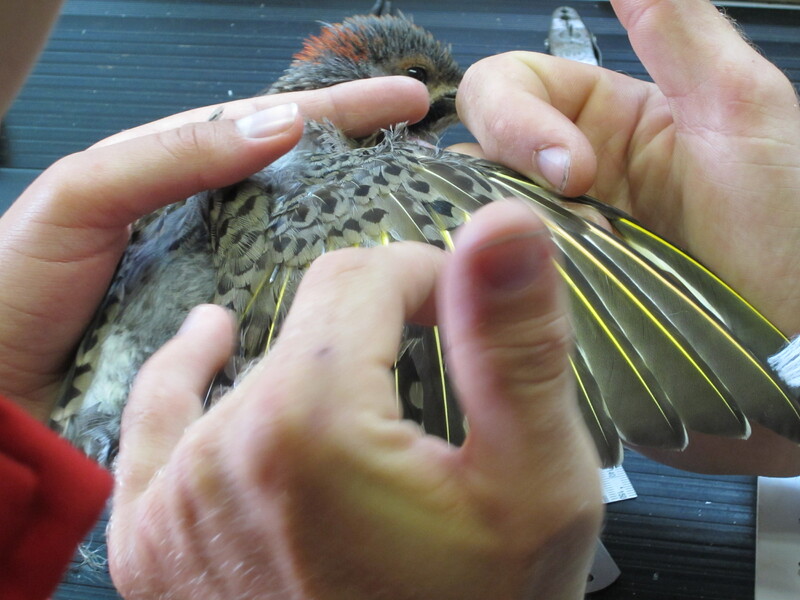 Aug. 11: More banding this morning, but no particularly exciting species. 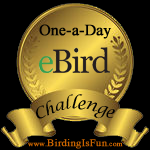 Stu showed those of us who don’t already have them how to set-up eBird accounts, and Katie entered all of the numbers from our Big Day into eBird. In the afternoon, Mary Gartshore came to teach us how to make study skins. We each had a bird, killed from a window strike or that had been hit by a car to work on. 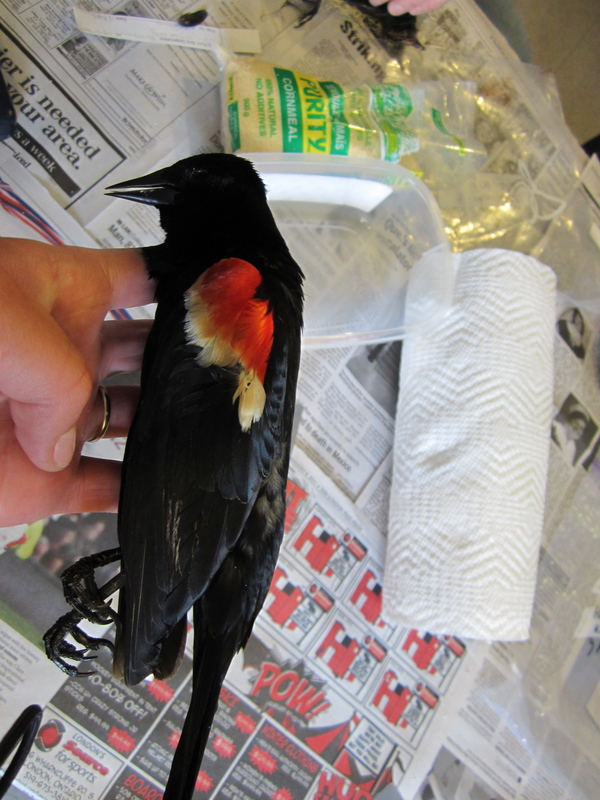 Most of the YOWs had Baltimore Orioles, and I had a Red-winged Blackbird. 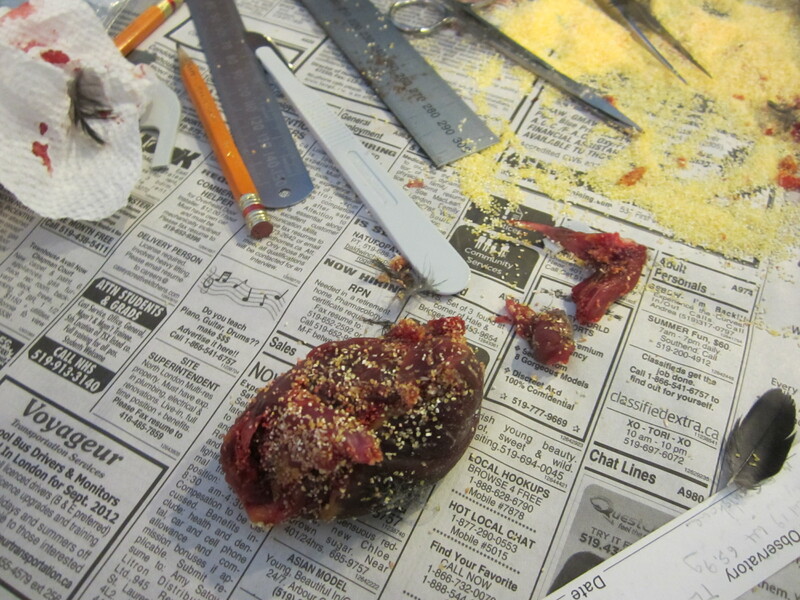 Warning, some of the photos below, taken during the skinning bee, are not for the faint-hearted! Stay tuned for part three! I hope to get it up as soon possible too. Wow! I don’t know exactly where to start, so I guess I’ll start at the beginning. 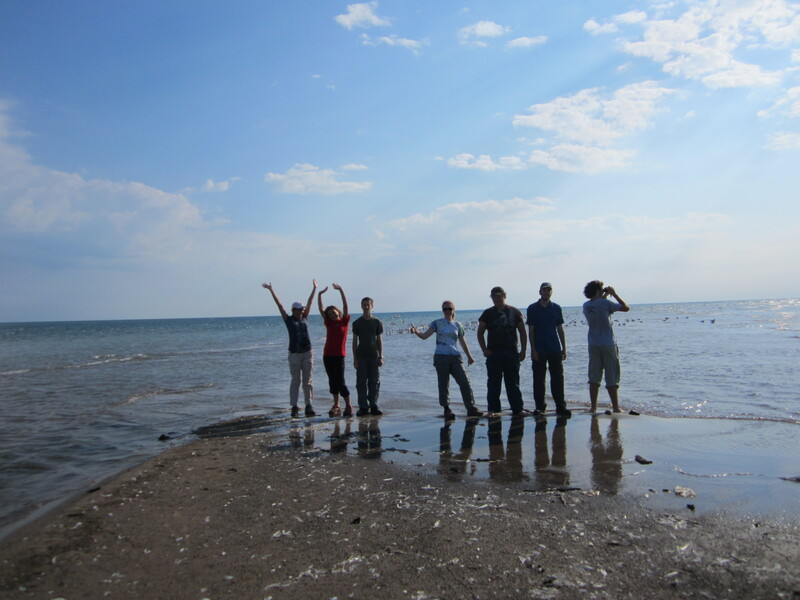 I had an amazing experience at the YOW (Doug Tarry Young Ornithologists’ Workshop) at Long Point, Ontario. I have so much to write about that I’m going to post about my adventures at Long Point in two (maybe more) parts. Aug. 3rd: I arrived a day early for the YOW to make sure I was at Long Point in time the program to start on the 4th. I flew on my own from Edmonton, Alberta, to Hamilton, Ontario, a nonstop direct flight on WestJet. Stuart Mackenzie, LPBO Program Coordinator, picked me up at the airport and drove me to Old Cut. When I arrived LPBO, I met Ana, LPBO assistant co-ordinator, and Matt, an LPBO intern. 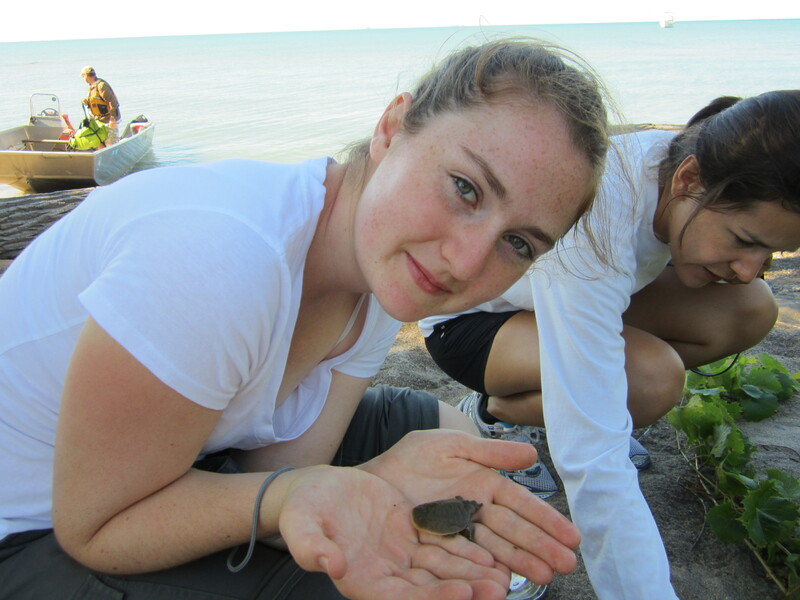 This year’s YOW program was run by Stu, Ana, Matt, and Jody, biologist and science educator. 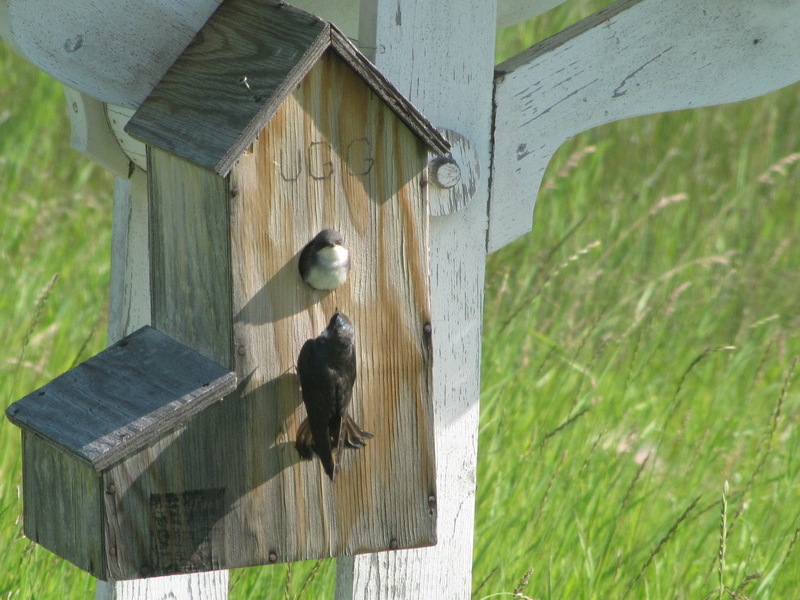 It was great being at Old Cut, because you could walk around the area and watch birds, which was perfect. 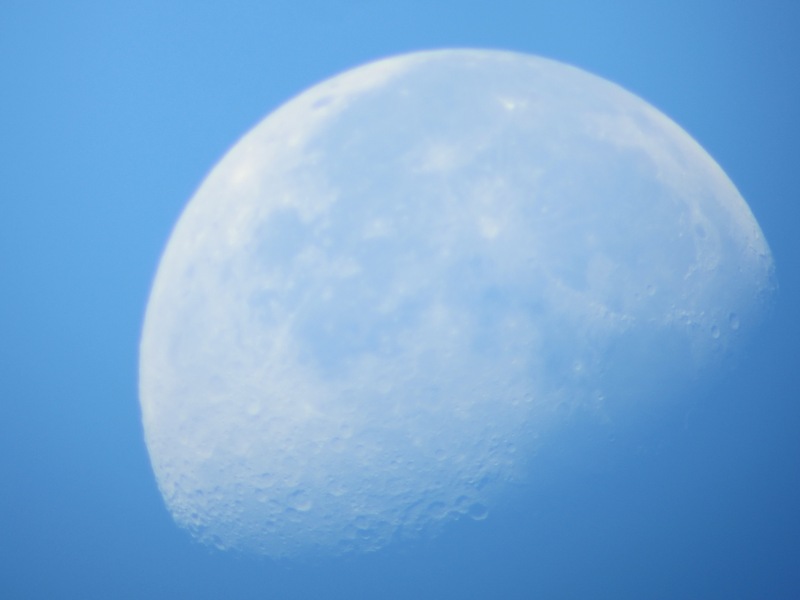 Aug. 4th: The other YOWs arrived around lunchtime — four boys and two other girls. Saskia is from British Columbia, Katie from Ontario, Justin from Ontario, Cody from Ontario, Antoine from Quebec, and Eitan from Pennsylvania (he is Canadian-American). 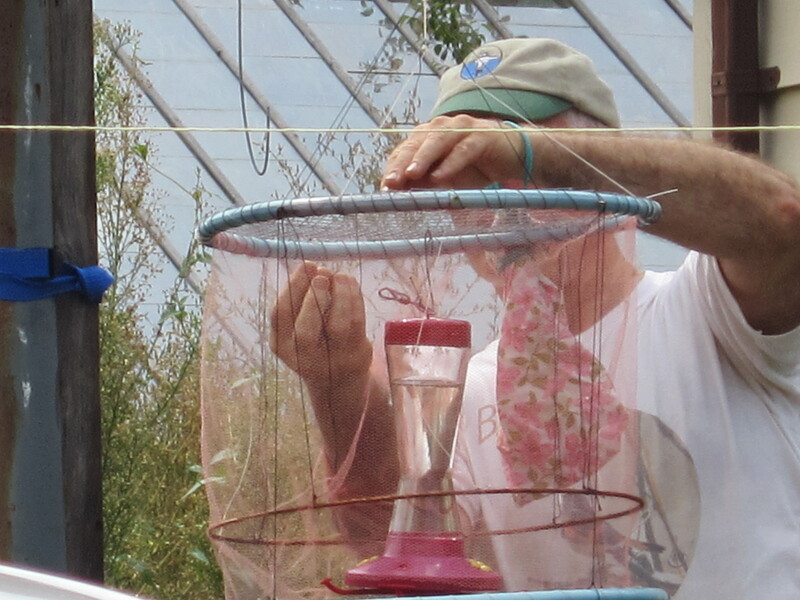 In the afternoon, Matt and Ana showed us how to put up and take down mist nets, used to catch the birds for banding. 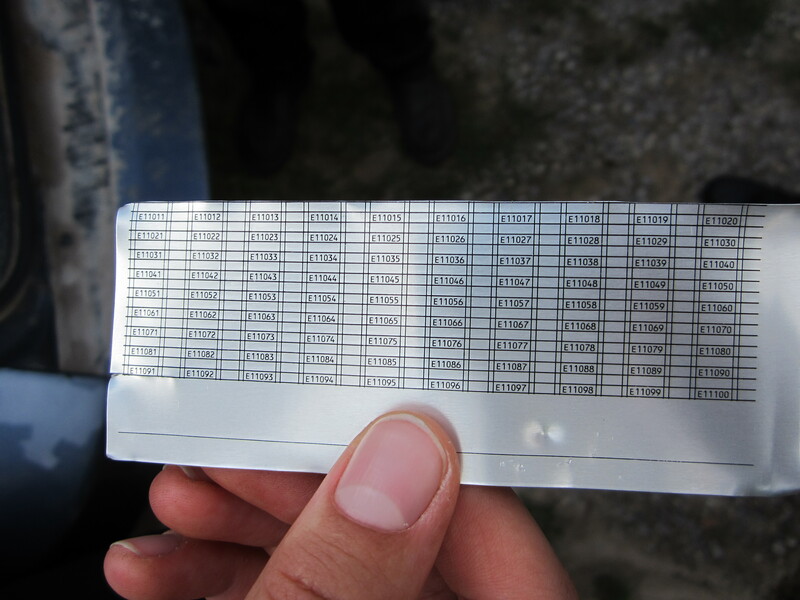 In the evening we went on a mock census walk to familiarize ourselves with the route. Ana and Matt go on census every morning starting around 7am for an hour. Aug. 5th: We woke up at 5:45, ate breakfast, then opened the 14 nets at 6 am. That morning was the first day of watching banding for the YOWs, we didn’t band anything but it was still very neat to watch Ana and Matt banding. 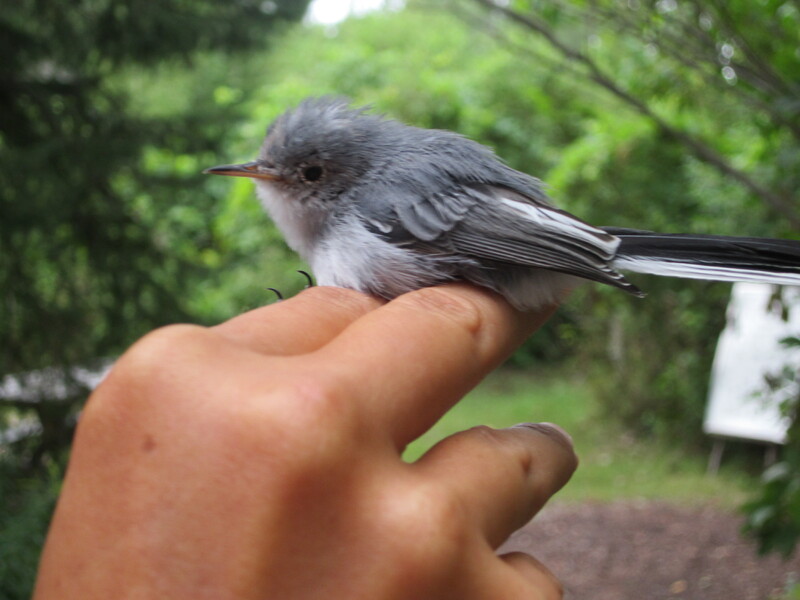 Most of the birds we caught were hatch-year Gray Catbirds, and many of them were re-traps. 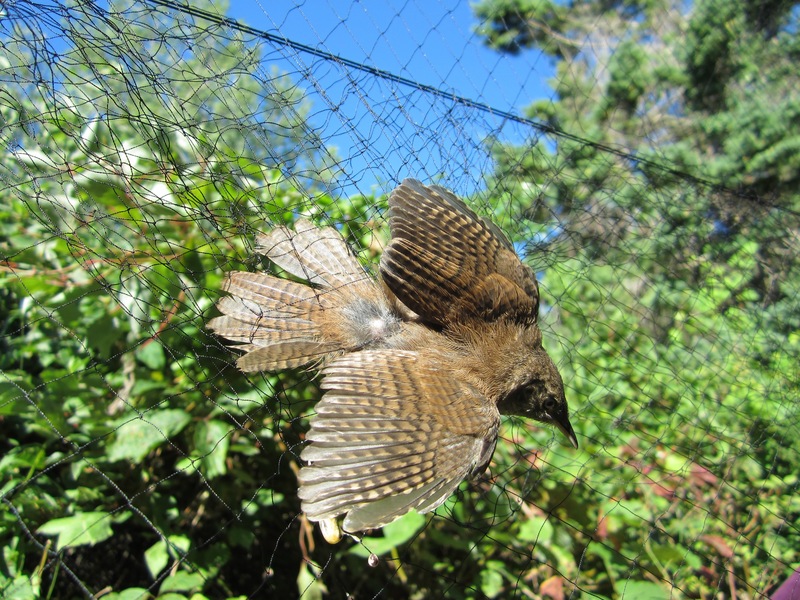 Three of the species we caught in the nets were life birds for me, American Redstart, Carolina Wren, and Black-and-White Warblers. In the afternoon we had a trip planned, but Matt, Ana, and Liza (from the Birds Studies Canada office) wouldn’t tell us where we were going. 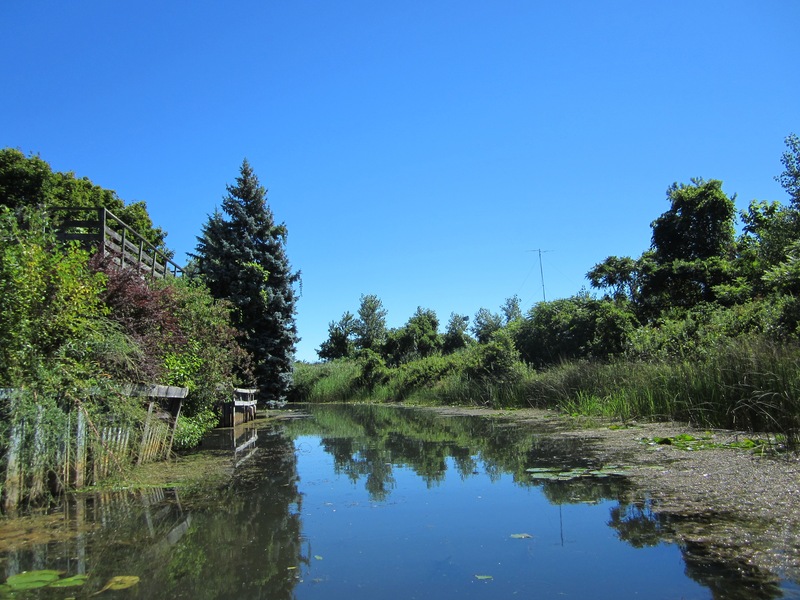 We drove about 10 minutes north of Old Cut to Pterophylla farm run by Mary Gartshore. 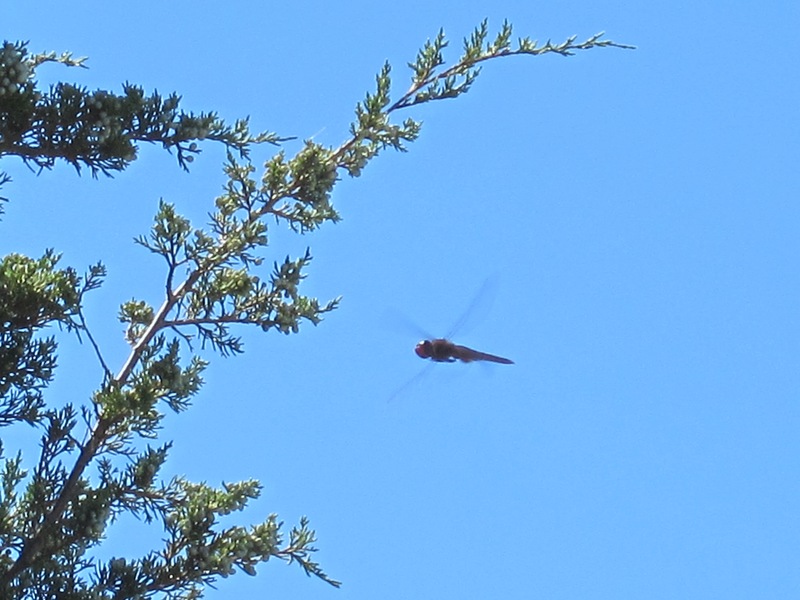 When we arrived, I saw two hummingbird feeders, with about 20 Ruby-throated Hummingbirds flying around. 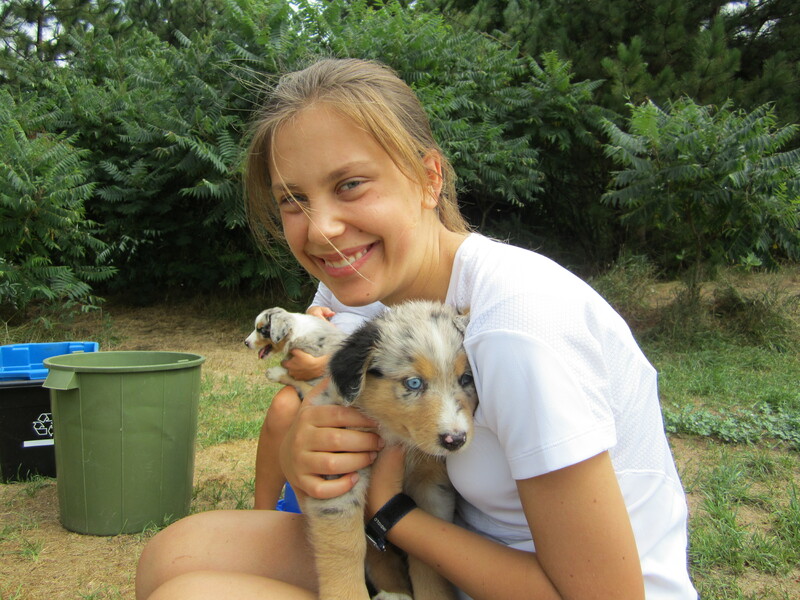 First, Mary told us a little about what she does at her farm, then she showed us her Australian Shepherd puppies which were very cute. 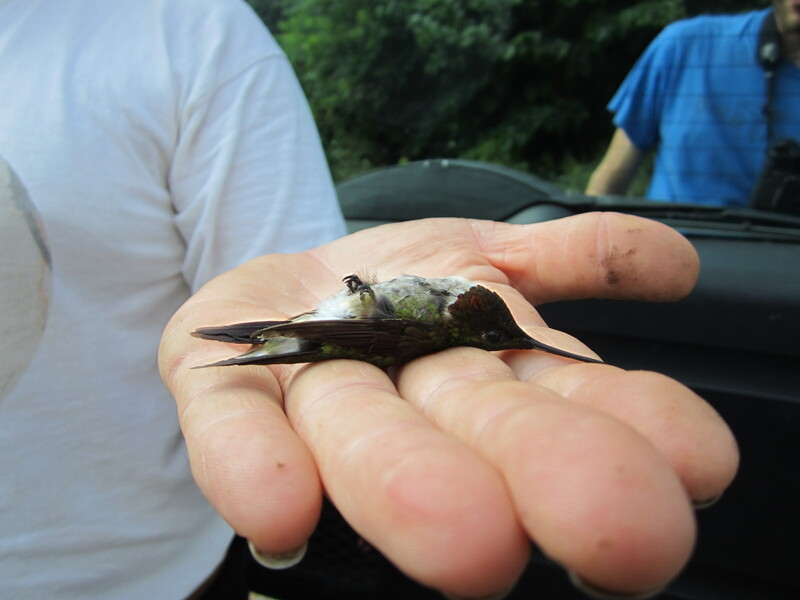 While we were with the puppies, David Okines, an Ontario hummingbird bander and president of the Ontario Bird Banding Association, was catching the hummingbirds with a net placed over the feeders; he could raise or lower the net with some string that he was able to control from the back door of his car. 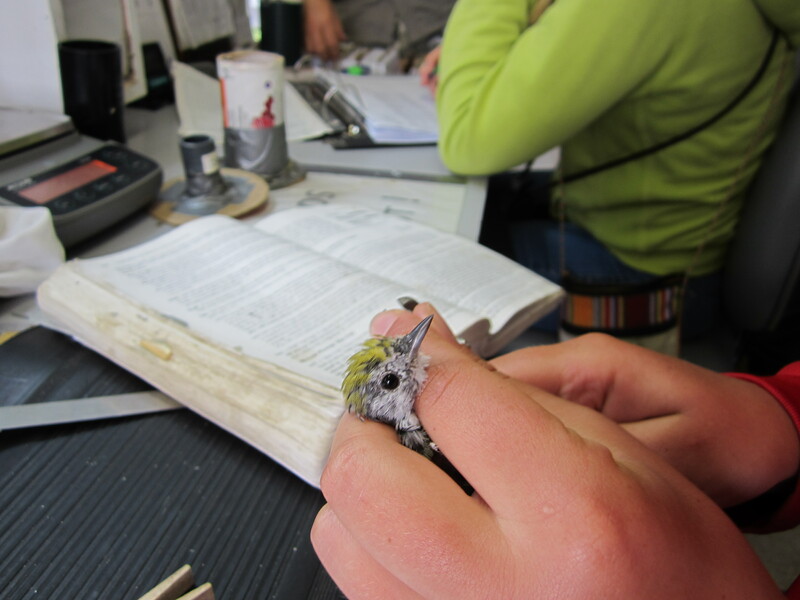 None of us had any idea that we were going to have the chance to band hummingbirds, and for all of us this was the first bird we have ever banded. The bands for hummingbirds are so small. I think we all had a fear a losing a band and two did get lost. 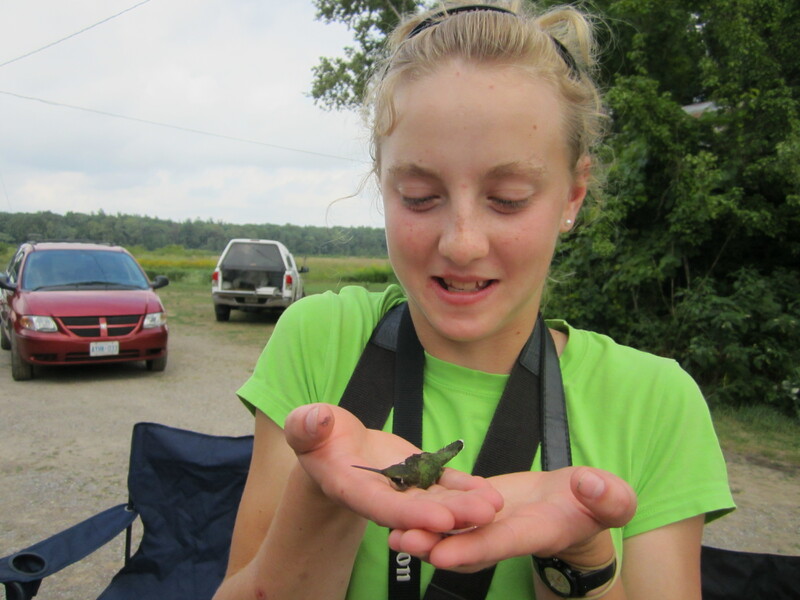 I found it quite hard to band hummingbirds because they are so small and their legs are so short. 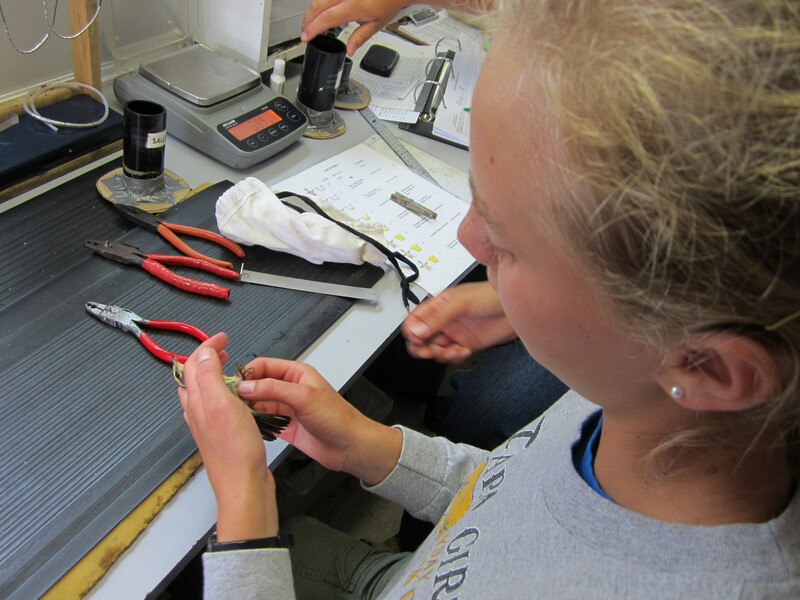 All of us were very excited to band hummingbirds and we couldn’t thank Mr. Okines enough for the opportunity. 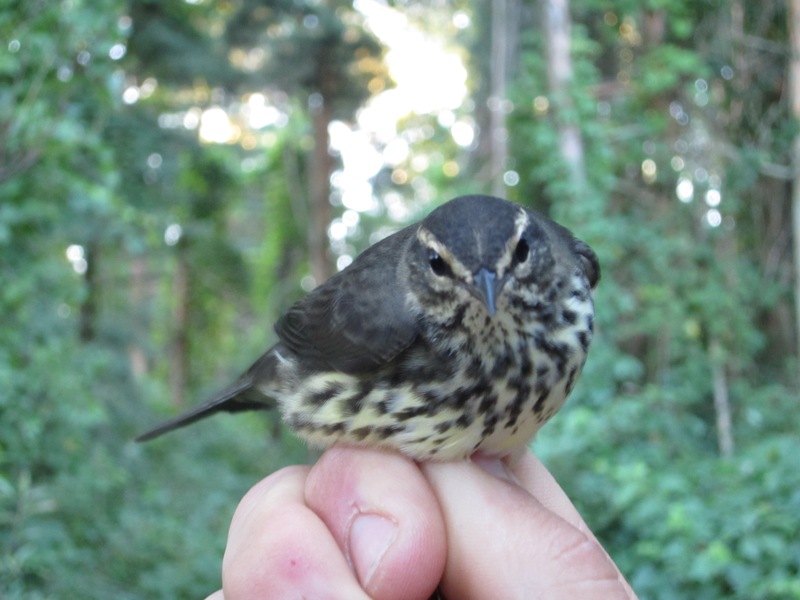 Aug. 6th: There was more banding today, with the highlights being Mourning Warbler, Northern Waterthrush, American Robin, and Rose-breasted Grosbeak. 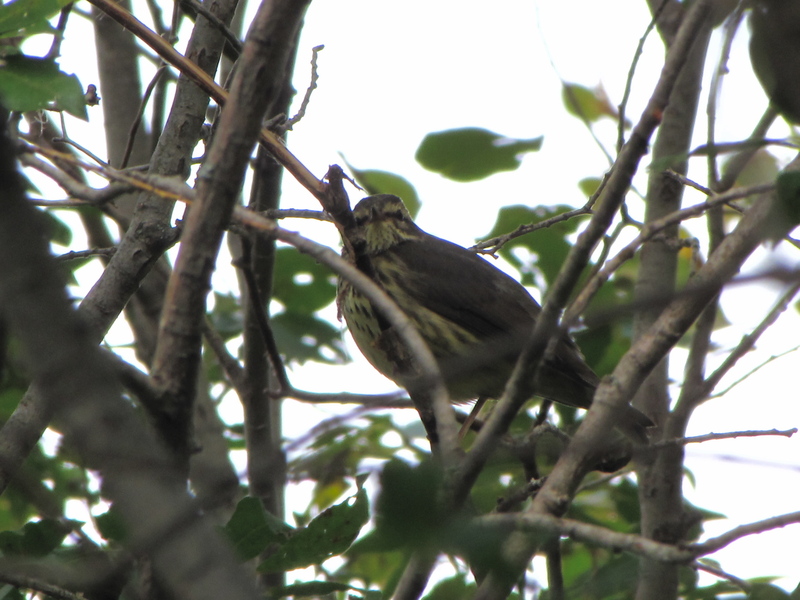 I wasn’t present for all the banding because Katie, Saskia, Stu, and I went on the hour-long census walk. 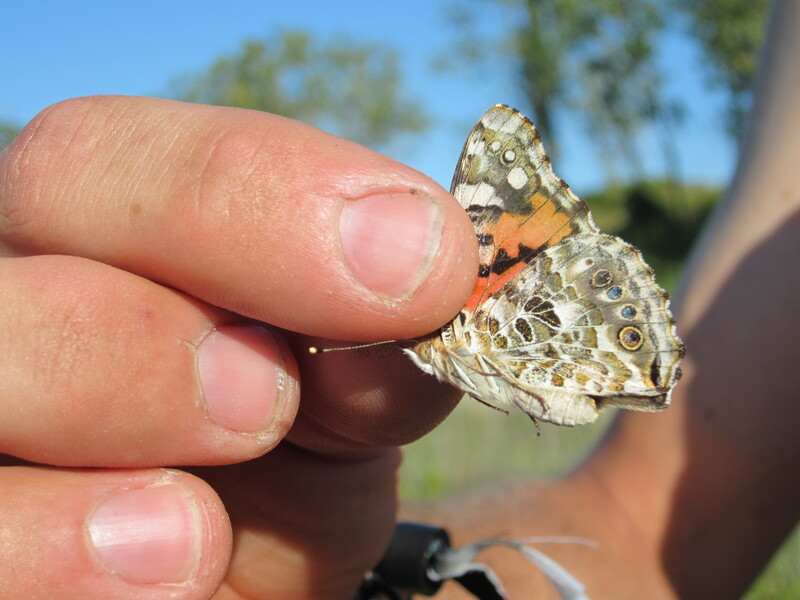 We were able to count 30 species on the census route. In the afternoon we prepared for our boat trip to the Tip of Long Point, we were all very excited about it! The boat ride, with a small motorboat took about two hours, and on the the way we stopped at some sandbars to look at the gulls, terns, Least Sandpipers, Semipalmated Sandpipers, and Sanderlings. The Tip is one of the most beautiful places I have been to. Although there were people walking along the beaches, our group were the only people inland. Once we had brought all of our supplies to the house, Stu told us to get ready for a scavenger hunt. 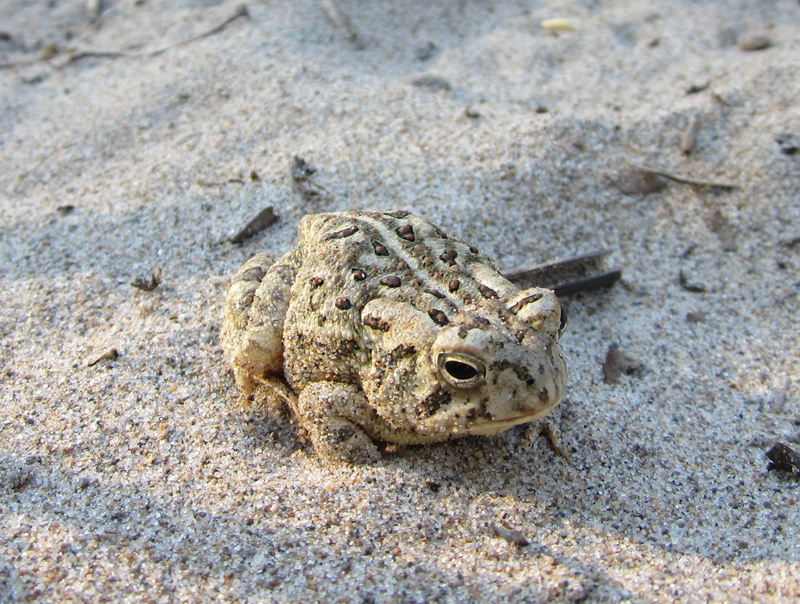 He split us up into two teams, and we each had quite a few things we had to collect: sand from both beaches, evidence of a reptile, driftwood, photo of a Monarch, milkweed pod, a piece of the lighthouse, a Fowler’s Toad, and a few more objects. My team did quite well, we found all but two objects. 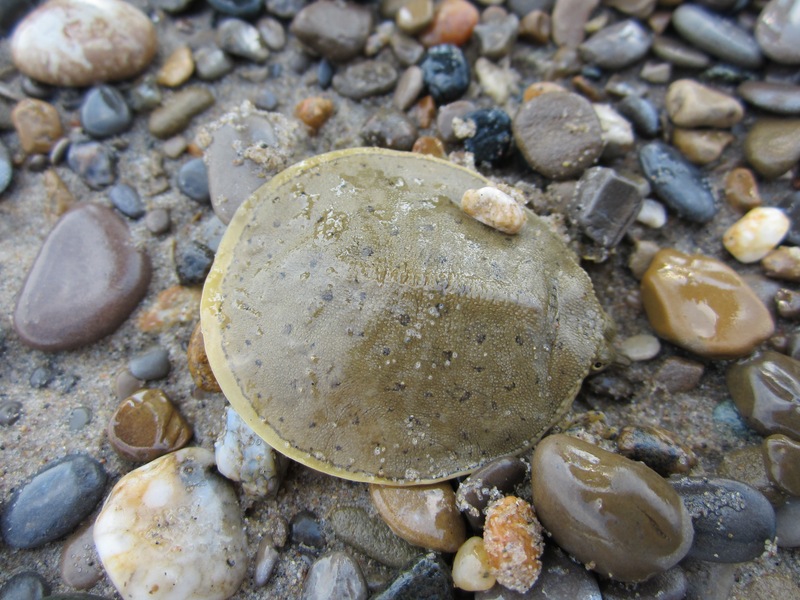 One of the objects we didn’t find, but the other team found a small Eastern Spiny Softshell Turtle, a turtle that is threatened provincially and nationally. 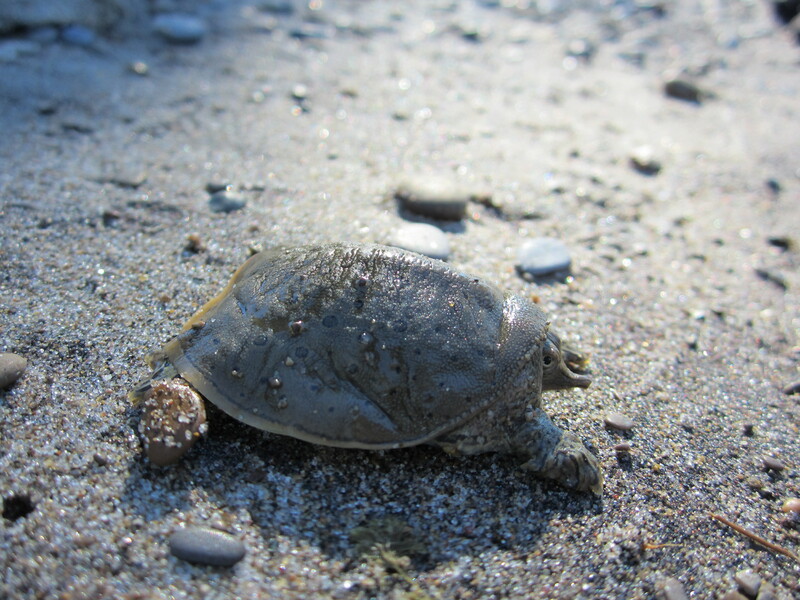 The turtle they found was quite small but they can grow to be very large. Aug. 7th: Our Tip census started at 7:15. We saw Great Blue Heron, Green Herons, Traill’s Flycatcher, Red-breasted Mergansers, Field Sparrows, Chipping Sparrows, Barn Swallows, Yellow Warblers, Cedar Waxwings, Ring-billed Gulls, just to name a few. From 10:30 to 1:00 Ana showed us how to conduct a Breeding Bird Survey, though of course there aren’t any breeding birds at this time of year. 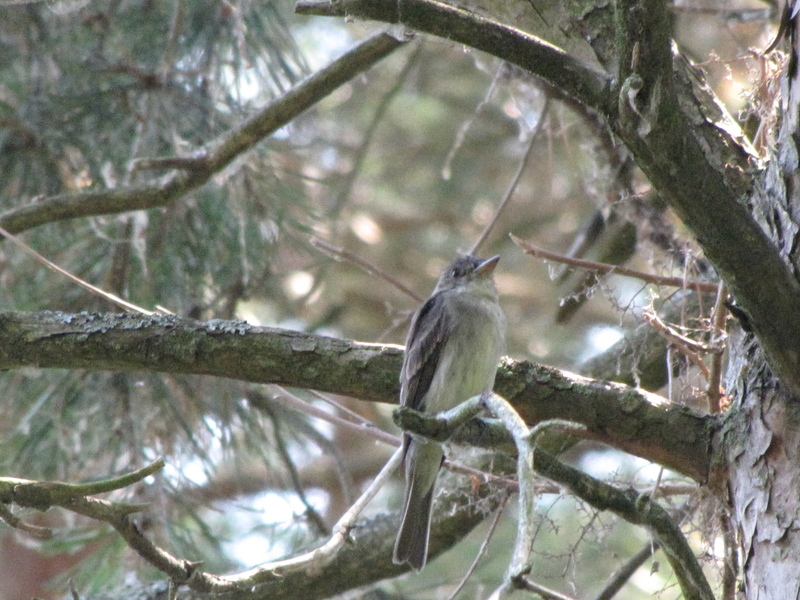 Most of the birds we had already seen on census, but we did see a Red Fox and a Sharp-shinned Hawk being chased by a Eastern Kingbird. From 1:00 to 4:30 we went swimming and played monkey in the middle in beautiful Lake Erie, which was lots of fun! 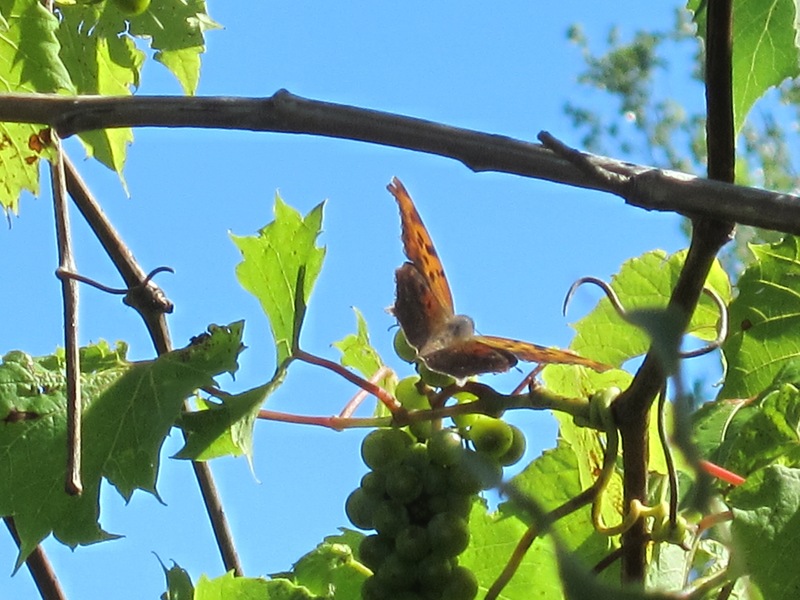 At 5:30 we started our Monarch butterfly survey, the goal being to count as many Monarchs on our census route, and we also were to count other butterflies we saw on the route. 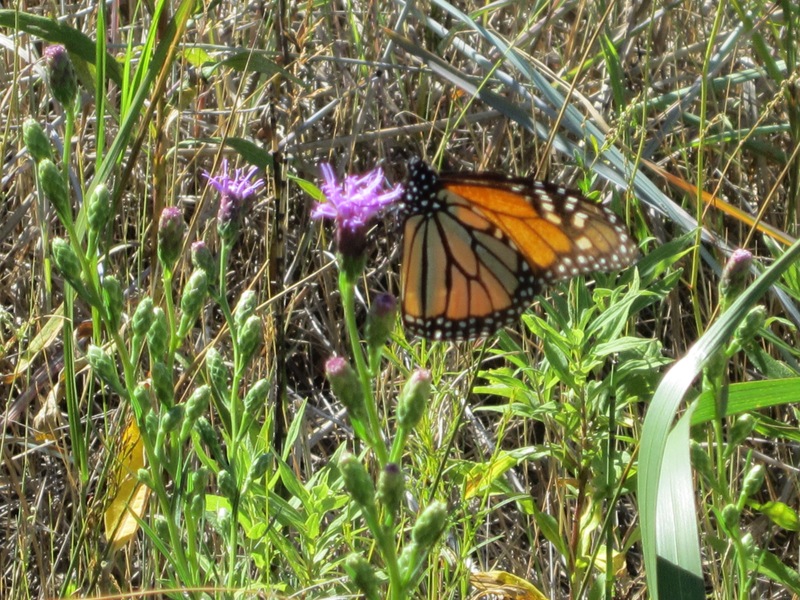 We counted 91 Monarchs, three Painted Ladies, one Orange Sulphur, four Cabbage Whites, one Northern Crescent, and one Red Admiral. 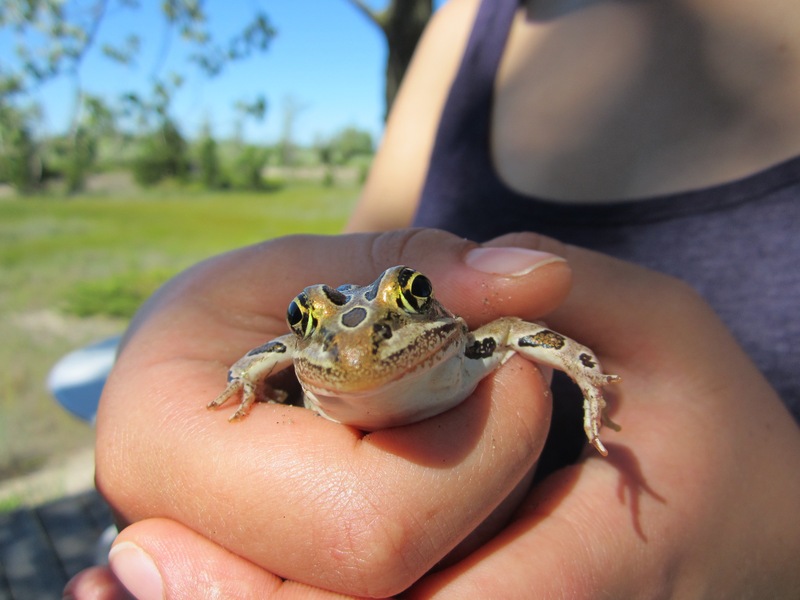 While looking for butterflies, Saskia found a Fowler’s Toad, an other threatened species. Stay tuned for part two! I hope to get it up as soon possible.